This is the dessert I made for us on 4th of July. We had went out to the farm the day before to visit the petting zoo and see what was fresh in from the fields. They had just brought a truck in loaded with blueberries and the girls were putting them in containers. We asked if we could buy some. So we had fresh blueberries. And the only other fresh fruit I had at the trailer was bananas. So, I brainstormed and came up with this little yummy dessert. After rinsing the blueberries, I took a couple of handfuls and put them in a bowl and smashed them. For lunch we had canned peaches so, I saved the juice from the two cans and mixed it in to the smashed blueberries. Then I tossed and stirred the rest of the blueberries into the bowl. At this point, if you want it a bit sweeter add 2 teaspoons of sugar or Splenda. I did this in the morning and into the fridge it went until that evening for dinner. By the time I was ready to make these, this had set up and created a nice jell. Okay, let’s make this dessert! 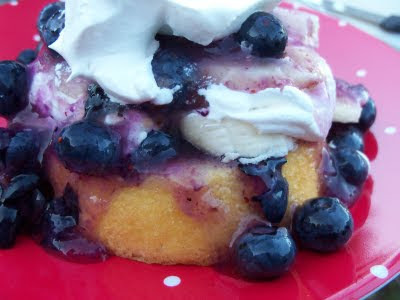 We have out blueberries, little shortcakes, sliced bananas (I used 1/2 banana per shortcake) and our whipped topping. Blueberry mixture. You want to get a good amount of the jell/juice to soak into the shortcakes on the first layer. Spread on some whipped cream. Another layer of slice bananas. Finish off with a dollop of whipped cream! This made for a really pretty 4th of July dessert. Taking advantage of fresh, in season, blueberries. You could make this with whatever berries are in season. Blackberries or raspberries would be so delicious! A quick, pretty and easy dessert served nice and cold at a hot picnic. It is so refreshing and really hit the spot! I hope you enjoy this recipe! And have a wonderful day! I think I'd like this for breakfast! YUMMY! I think that I just gained 5#s,lol it sure does look yummy. I love blueberries. Yummm. Blueberries are very healthy for us all. This would even be a good idea for the ice cream social parties coming up. Thanks for sharing your honest opinion! It really does sound and look yummy! You just cannot go wrong with blueberries! That looks delicious, Diann! You are such a creative cook. It is pretty too. We have blueberry bushes and have been blessed with an abundance this year. Wow, this looks so good!! Bananas and blueberries sound like a great combination with that yummy whipped cream! OH! This looks yummy! I haven't had breakfast yet and I wish I had some of this for breakfast! Thanks for sharing it with us! Your dessert looks delicious...fruit desserts are my favorite, much more so than chocolate! That looks yummy! And very celebratory for the holiday. That looks delicious! What a great combo of fruits for a shortcake. Thanks for linking it up at Home Sweet Home!